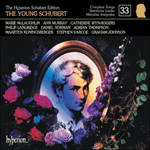 The anti-Salieri bias in this memoir (by 1858 Salieri was already being unfairly cast as a villain in the demise of Mozart) cannot disguise two things: that Schubert was Salieri’s willing and ‘assiduous’ pupil, and that the young composer was expected to steep himself in Italian music, and get to know a great deal of it. And it is fair to point out that Schubert’s technical education with Salieri is among the best documented of teaching regimes undertaken by a great composer. Among other things, Schubert was introduced to the concept of vocal Fach – that certain voices are capable of certain ranges. After this, the unreasonable vocal demands of earlier pieces (such as Hagars Klage and Leichenfantasie) cease to be a troubling feature of the young composer’s work. If only Robert Schumann, for example, had been given similar instruction at an early age, his earlier Lieder would have been better written for different types of voices, and easier to sing. The two settings of Quell’ innocente figlio (from Metastasio’s oratorio Isaaco where these words have the subtitle Aria dell’ angelo) were submitted to Salieri as part of a much larger set of composition exercises. 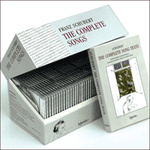 Schubert set these words some nine times: for soprano alone; for two sopranos; for soprano, alto and tenor; for soprano, alto, tenor and bass; then another three versions for soprano, alto and tenor followed by three further versions for vocal quartet. The tune of each of these settings (which are all either in F or G major) is subtly different: four of them are in common time, five are in 3/4. As this project was conceived as an exercise in prosody and part-writing, nowhere in D17 has Schubert provided a piano accompaniment. This is a pity (here rectified by Hoorickx) because in this music – hard to appreciate in unaccompanied form – we hear the beginnings of Schubert’s genius for melody. For example, in the first of these two versions of the Metastasio text (for solo soprano) we hear a vocal line that is prophetic of Schiller’s Der Jüngling am Bache, D30. Schubert has been taught much (and he has been encouraged to experiment for himself) in the realm of Italian word-setting, He has then grafted the fluidity and sensuality fostered by the Italian language on to the impressionable and young German Lied. This then is the beginning of the miracle that was to reach its first immortal manifestation in Gretchen am Spinnrade. The story of Abraham and Isaac is an extremely dramatic one (cf Britten’s second Canticle, Abraham and Isaac). We know how Schubert reacted to another biblical story – the concubine’s Hagar’s expulsion into the desert with her child (Hagars Klage). The young composer reacted to these words with ardour, and perhaps a bit too much dramatic flair for the singer’s vocal comfort. Here, on the other hand, the emotion behind the imminent death of Isaac at Abraham’s hand is not allowed to get out of hand. Everything is subordinated to the comfort of the singer and the beautiful vowels of the Italian language. Salieri wants polish and poise, not raw German truth. Schubert attempts to inject a bit of passion into this suave music (the high note at the end of the solo version, for example, at ‘Quello vuol Dio da te’) but here he is beginning to learn how to create emotional tension through melody. This is a lesson that composers like Zumsteeg and Reichardt never assimilated. Schubert, in his own way, was to be the equal of Mozart (another Metastasio collaborator) in bringing together Italian sensibility and German learning, in marrying Italian polish in the galant style with the passion of Germany’s new romanticism. Quello vuol Dio da te! Chi vita già gli diè.